Plus: Today’s your last chance to register online! Join over 300 of your new BFFs who have already signed up. Walk-ins are (of course) welcome, but the price goes up at the door. And just to sweeten the pot a little more…if you register today, you’ll be entered to win a FREE night at the Royal Sonesta...and we hear maybe a trip to Greece and Israel too?!! Thanks for being a Jewgooder! More than 80 fabulous folks joined us for the kickoff of our new event series! Check out all the awesome pictures. 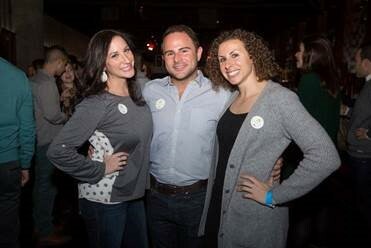 Don’t fret if you missed out—the next Jewgooder event is on March 10, where you’ll have the chance to sip delicious beverages, connect with friends and support a fantastic cause. Keep an eye out for more details! New England Yachad: The Outing Club – Adventure, Leadership Skills and Fun! Next up: the winners of our Mezzanine and Venture Grants! Check out next month’s Rundown for all the details. Want a chance to put yourself on the list? Apply for the next round of grant funding! Yeah, you heard us—this year’s Young Adult Summer Mission is going to Israel and GREECE!! Before you break out your passport (you already did, didn’t you?) get all the details at our info session on February 25 or March 28. From kings, to prophets, to priests, the Hebrew Bible showcases several models of human power—but each face unique challenges. On February 10, Dr. Erica Brown helps examine these examples and their relevance to today during The Genesis Forum’s latest session. IDF Colonel (Ret.) and Israel expert Miri Eisen joins israel360 on February 24 for a fascinating discussion on geopolitics in Jerusalem. Explore the epicenter of the city’s potential to bring about religious fervor, and discuss new ideas for its future. On February 25, our partners, JCRC, will host the Annual Legislative Reception to honor an outstanding group of women leaders who’ve done incredible work in government, advocacy and the community. The event is free (!) but registration is required—secure your spot now. Eser’s spring series explores ten hot social issues you can’t ignore, covering an array of uber-relative happenings ripe for discussion. Check out the topics and sign up now! Come on down to the InterContinental Hotel on March 30 for the Real Estate, Construction & Design Annual Dinner! Network with industry peers, help us honor Robert and David Epstein of The Abbey Group, and hear from keynote speaker Mayor Martin J. Walsh. You can register right here, right now! In just a few short months, the days will be longer, the weather will be warmer and you’ll be jetsetting off to Israel! That’s right, summer Birthright Israel will be here before you know it. Stay tuned for registration information—or, if you’re a go-getter, email Karen at karenn@cjp.org to get on our VIP list for CJP’s Boston Community Birthright Israel bus! Join members of the LGBTQ community from across North America for a groundbreaking mission to Israel! From May 26-June 2, you’ll meet with Israel’s top LGBTQ politicians, business leaders and innovators, spend time with IDF members, experience culture and cuisine, and so much more. February 5 | 4:45 p.m.
February 12 | 4:54 p.m.
February 19 | 5:03 p.m.
February 26 | 5:12 p.m.